P0037 HO2 HTR (B1) (HO2S heater control circuit low bank 1 sensor 2) The current amperage in the heated oxygen sensor 2 heater circuit is out of the normal range. 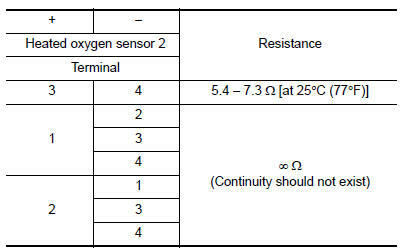 P0038 HO2 HTR (B1) (HO2S heater control circuit high bank 1 sensor 2) The current amperage in the heated oxygen sensor 2 heater circuit is out of the normal range. YES >> Proceed to EC-178, "Diagnosis Procedure". Disconnect heated oxygen sensor 2 (HO2S2) harness connector. Check the voltage between HO2S2 harness connector and ground. Check the heated oxygen sensor 2 heater. Refer to EC-179, "Component Inspection (HO2S Heater)".